Life's little details...: God Only Knows-CCB Video Inspiration! God Only Knows-CCB Video Inspiration! 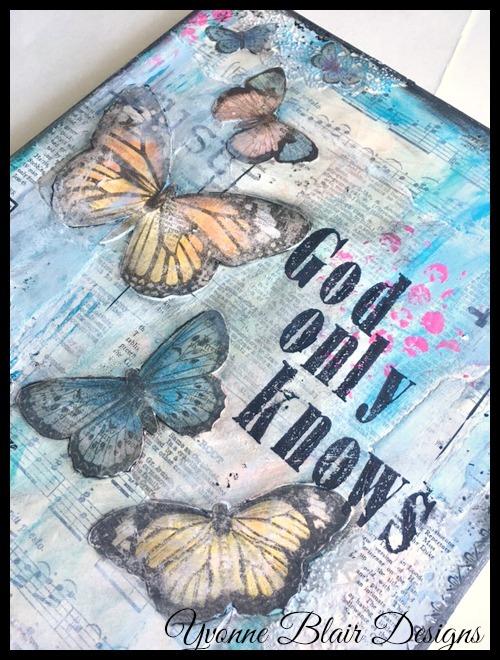 Today I am sharing my project that was inspired by the video-God Only Knows. Linda Ledbetter was the genius who thought of it! It was definitely new for me. When I watched the video one message kept coming through. The video was so whimsical and dreamy. I would have loved to jumped in and played! Have you ever done that...pictured yourself in the middle of it? and trusted the journey would take me where I needed to go! because they are limited and what if you use them and then you find something else to use them for. LOL...I do that! Lately I have been trying to use the things I have instead of hoarding it. AND I have to say...I love where this went! hehehe. 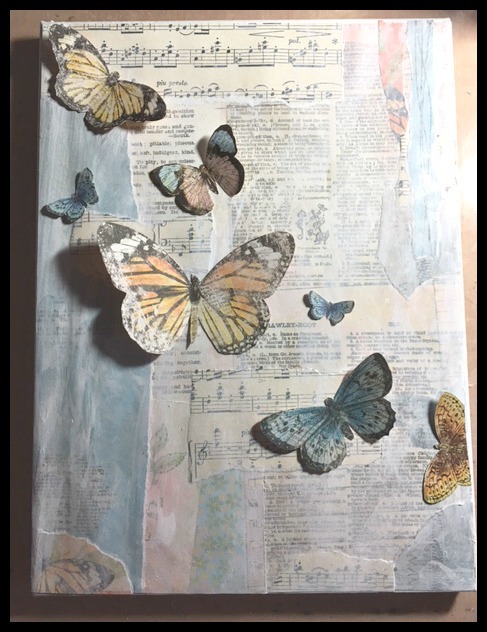 I collaged some of the papers (torn) onto the canvas using Multi Medium. Still my favorite medium for adhering things. I wish I had a BIG gallon jug of it! white acrylic paint. I wanted the background to be more subdued. spritzed some water and basically finger painted lightly. Once I had the colors the way I wanted it, it was time to start adding embellishments. Adhered those with Multi Matte as well. Doilies were added to give it some more texture. Then I stamped the word 'trust' from my stamp line with Impression Obsession. and went right over it lightly! Now it was more in the backgroud! Yes! I used my typewriter to type out the words believe and faith several times. Cut those into little word strips and adhered those as well. 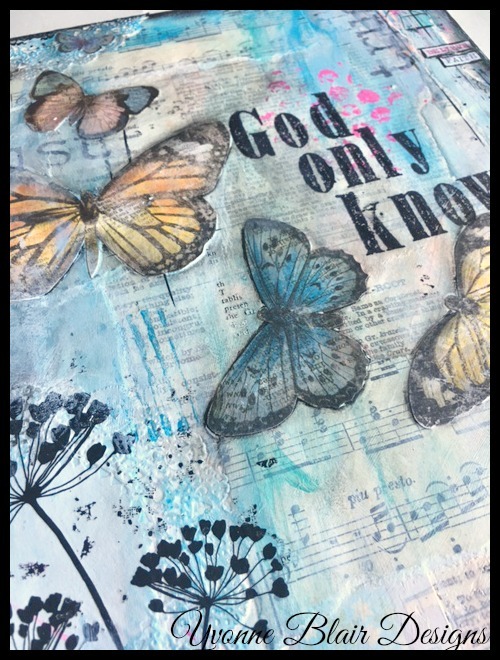 I stamped 'God Only Know' with one of Tim's alphabets from Stampers Anonymous. They Typewriter is from We R Memory Keepers. The think I love about it is..you can change the ribbons. They have MANY different colors! for those of you who also scrapbook! Of course, I had to use the PINK one with the black! Now I just finished off the embellishing using rub ons and a paint scrapper. The only thing left to do was give it definition. I used my Distress Crayon in Black Soot to go around all the edges and rub. I LOVE what happens when you rub! I did the same around the butterflies and called it a day! I have learned that it is true. 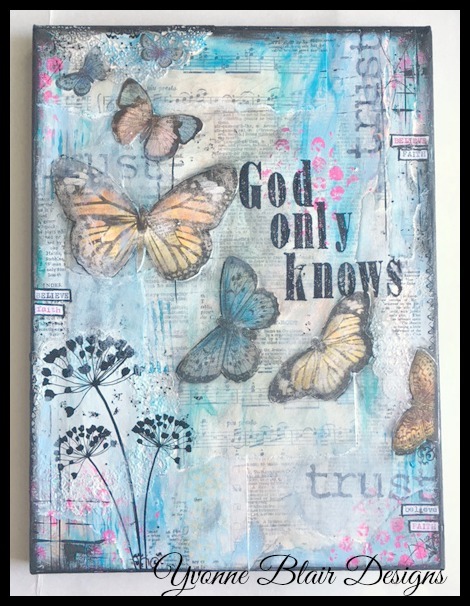 God Only Knows....I trust that even through the most difficult times of my life God has been with me, even when I strayed. God will always be with us, no matter what. All we have to do is to remember that, trust in that, believe in that and we will never be alone. I hope you enjoyed! I hope you are playing along with us at Creative Carte Blanche! If you haven't yet seen the video you can go watch it here in the original post! truly beautiful, fun and whimsical projects! Hope you have a great day and find your inspiration! Thank you Anne! That Bo Bunny paper is one of my favorites of theirs! I am almost out, sadface!!! Thanks for stopping by! Just beautiful! Thanks for sharing all the details of your process. It is a wonderful sentiment. Beautiful and so YOU, Yvonne!!! Love your God Only Knows piece. Awesome page, Yvonne. So you!